The Tories are courting the most anti-Semitic demographic of all whilst smearing Labour as anti-Semites! One of the most incredible things about right-wing propaganda is the extraordinarily contradictory nature of it. Take the resurgence of the anti-Semitism smears against Jeremy Corbyn and the Labour Party as an example. We all know that these kinds of smears are intended as distraction tactics because the Tories have lost the argument completely when it comes to actual policies, so they resort to smears. A few weeks ago they were smearing Corbyn as a communist Czech spy, then he was supposedly a Putin stooge for capitalist Russia, then he's a hard-left Marxist again, then he's a Stalinist for demonstrating the leadership skills that Theresa May so badly lacks, and now it's back to anti-Semitism again. One of the big problems with the right-wing using accusations of anti-Semitism to attack Jeremy Corbyn is that these very same people were perfectly happy to use anti-Semitic tropes to attack Ed Miliband when he was Labour leader. When anti-Semitism is useful to the Tory purpose of defending the interests of corporations and the mega-rich they're perfectly happy to use it as a weapon to attack a Jewish leader of the Labour Party, but when they're feeling afraid because Jeremy Corbyn's centre-left policies are so popular, they use accusations of anti-Semitism against him to distract people from talking about policy. Then there's the grotesque history of anti-Semitism within the Tory party itself. When the so-called hard-left stood in solidarity with the Jews, the Irish and the working class to beat Oswald Mosley and the British Union of Fascists at the Battle of Coble Street in 1936, the Daily Mail were telling their readers to join the BUF, propagandising against Britain accepting Jewish refugees from Nazi persecution, and Tory politicians were signing up in droves to secret anti-Semitic pro-Nazi societies called the Right Club and the Anglo-German Link. Then there's the history of right-wingers using anti-Semitism to attack the left. Until very recently the political right regularly used the anti-Semitic "Jewish global conspiracy" trope to attack the left, using Jewish left-wing figures like Karl Marx, Leon Trotsky, Emma Goldman, Rosa Luxembourg, Karl Liebknecht, Ralph Miliband, Noam Chomsky and Bernie Sanders to argue that left-wing politics is actually a Jewish plot to control the world. To seamlessly go from these anti-Semitic attacks against the left to decrying the left as anti-Semitic takes some incredible brass neck. Then there's the fact that the head of the pro-Corbyn campaign group Momentum is a Jewish guy called Jon Lansman. The right-wingers want people to simultaneously believe in two mutually exclusive pieces of anti-left propaganda. They want the public to fear and despisee Momentum which is led by a Jewish guy, and they want us to hate Labour because it's supposedly an anti-Semitic party! The only way these two positions can be reconciled is by using the vile anti-Semitic trope of the "self-hating Jew" to dismiss the existence that Lansman and all other Jewish members of the Labour Party. And this is precisely what Theresa May did in parliament. She was desperate to deflect public attention from the devastating impact of Tory cuts to the local government budget that she casually dismissed every single Jewish member of the Labour Party as a bunch of self-hating Jews with her outlandish claim that there is no place for people who oppose anti-Semitism in the Labour Party. Then there's the fact that the Tories have a very clear strategy of appealing to the hard-right ultranationalist blue-kip demographic who are fleeing the wreckage of UKIP. 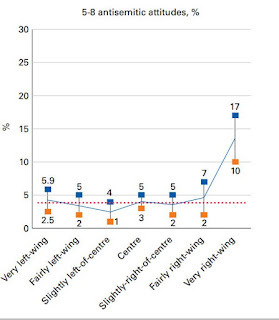 Analysis by the Institute for Jewish Policy Research has found that anti-Semitic attitudes are very much more prevalent amongst extreme right-wingers than any other political demographic (see image). So the Tories are attempting to pull off a truly incredible balancing act. 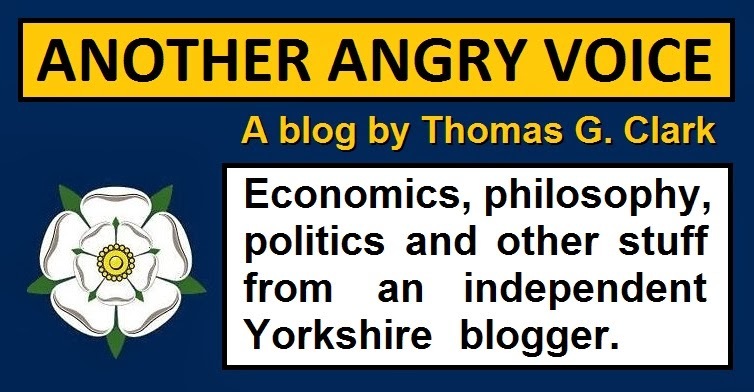 They're working their socks off to attract the deeply anti-Semitic hard-right ultranationalist blue-kippers into the Tory fold (because they know they'll never be able to cling onto power without them) whilst they simultaneously try to smear the political left as a bunch of anti-Semites! 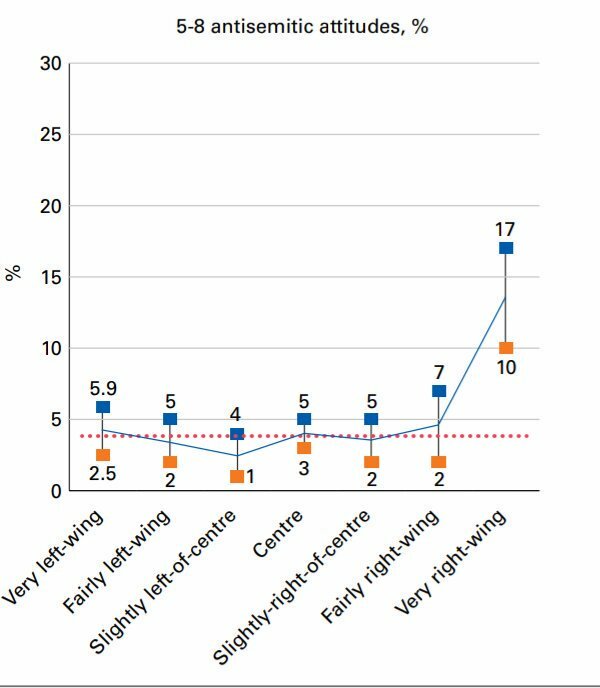 The resurgence of the anti-Semitism smears right before the local elections is a very clear indicator that the Tories really don't want people talking about policy. The reason being that if the debate focused on policy then attention would obviously fall on the catastrophic consequences of the ideologically driven Tory cuts to the Communities and Local Government budget. The Tories have reversed history to distance themselves from their own party's sickening history of anti-Semitism, and from the anti-Semitic tropes they were perfectly happy to use to attack the left with when Labour had a Jewish leader just a few years ago. 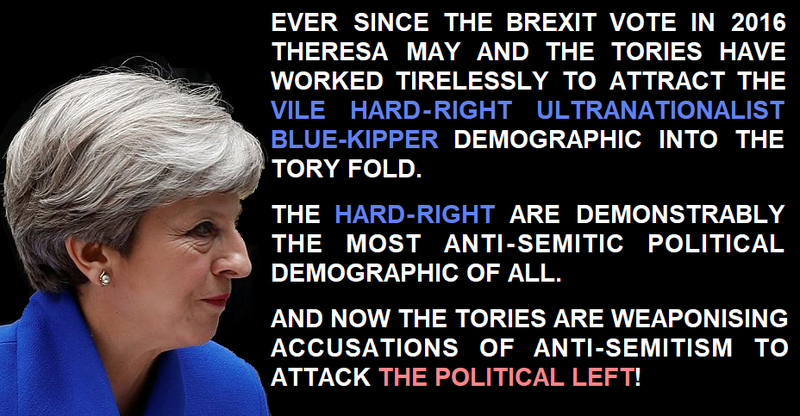 The Tories have incredible cheek to use anti-Semitism smears against the left when their only hope of electoral survival is to attract support from the hard-right ultranationalist blue-kippers, who are demonstrably the most anti-Semitic demographic of all. Theresa May actually used the profoundly anti-Semitic "self-hating Jew" trope to attack Jewish members of the Labour Party just last week, but the mainstream media apparently don't give the slightest damn about the disgusting spectacle of a non-Jew using an anti-Semitic trope to accuse actual Jewish people of condoning anti-Semitism, even when it's the Prime Minister doing it! With their history-rewriting, reality-reversing, smear-mongering campaign the Tories are proving one thing beyond doubt. It clearly takes a boundless amount of contempt towards members of the general public to assume that we're so ignorant of history, absurdly gullible, and thoroughly immune to cognitive dissonance that we'd actually fall for their cynical weaponisation of anti-Semitism in order to distract from their own appalling record in government.